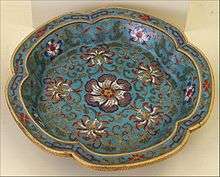 Ming Dynasty cloisonné enamel bowl, using nine colors of enamel. Cloisonné is an ancient technique for decorating metalwork objects, in recent centuries using vitreous enamel, and in older periods also inlays of cut gemstones, glass, and other materials. 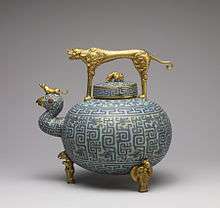 The resulting objects can also be called cloisonné. The decoration is formed by first adding compartments (cloisons in French) to the metal object by soldering or affixing silver or gold wires or thin strips placed on their edges. These remain visible in the finished piece, separating the different compartments of the enamel or inlays, which are often of several colors. Cloisonné enamel objects are worked on with enamel powder made into a paste, which then needs to be fired in a kiln. The technique was in ancient times mostly used for jewellery and small fittings for clothes, weapons or similar small objects decorated with geometric or schematic designs, with thick cloison walls. In the Byzantine Empire techniques using thinner wires were developed to allow more pictorial images to be produced, mostly used for religious images and jewellery, and by then always using enamel. By the 14th century this enamel technique had spread to China, where it was soon used for much larger vessels such as bowls and vases; the technique remains common in China to the present day, and cloisonné enamel objects using Chinese-derived styles were produced in the West from the 18th century. Byzantine cloisonné enamel plaque of St. Demetrios, c. 1100, using the senkschmelz or "sunk" technique and the new thin-wire technique. Cloisonné first developed in the jewellery of the ancient Near East, typically in very small pieces such as rings, with thin wire forming the cloisons. In the jewellery of Ancient Egypt, including the pectoral jewels of the Pharaohs, thicker strips form the cloisons, which remain small. In Egypt gemstones and enamel-like materials sometimes called "glass-paste" were both used. The Byzantines perfected a unique form of cloisonné icons. 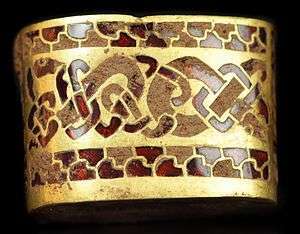 Byzantine enamel spread to surrounding cultures and a particular type, often known as garnet cloisonné is widely found in the Migration Period art of the "barbarian" peoples of Europe, who used gemstones, especially red garnets, as well as glass and enamel, with small thick-walled cloisons. Red garnets and gold made an attractive contrast of colours, and for Christians the garnet was a symbol of Christ. This type is now thought to have originated in the Late Antique Eastern Roman Empire and to have initially reached the Migration peoples as diplomatic gifts of objects probably made in Constantinople, then copied by their own goldsmiths. Glass-paste cloisonné was made in the same periods with similar results - compare the gold Anglo-Saxon fitting with garnets (right) and the Visigothic brooch with glass-paste in the gallery. Thick ribbons of gold were soldered to the base of the sunken area to be decorated to make the compartments, before adding the stones or paste. Sometimes compartments filled with the different materials of cut stones or glass and enamel are mixed to ornament the same object, as in the purse-lid from Sutton Hoo. 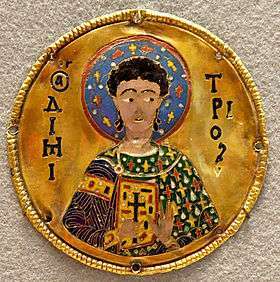 In the Byzantine world the technique was developed into the thin-wire style suitable only for enamel described below, which was imitated in Europe from about Carolingian period onwards. The earliest surviving cloisonné pieces are rings in graves from 12th century BC Cyprus, using very thin wire. Subsequently, enamel was just one of the fillings used for the small, thick-walled cloisons of the Late Antique and Migration Period style described above. From about the 8th century, Byzantine art began again to use much thinner wire more freely to allow much more complex designs to be used, with larger and less geometric compartments, which was only possible using enamel. These were still on relatively small objects, although numbers of plaques could be set into larger objects, such as the Pala d'Oro, the altarpiece in Saint Mark's Cathedral, Venice. Some objects combined thick and thin cloisons for varied effect. The designs often (as at right) contained a generous background of plain gold, as in contemporary Byzantine mosaics. The area to be enamelled was stamped to create the main depression, pricked to help the enamel adhere, and the cloisons added. Two different techniques in Byzantine and European cloisonné enamel are distinguished, for which the German names are still typically used in English. The earliest is the Vollschmelz ("full" enamel, literally "full melt") technique where the whole of a gold base plate is to be covered in enamel. The edges of the plate are turned up to form a reservoir, and gold wires are soldered in place to form the cloisons. The enamel design therefore covers the whole plate. In the Senkschmelz ("sunk" enamel, literally "sunk melt") technique the parts of the base plate to hold the design are hammered down, leaving a surrounding gold background, as also seen in contemporary Byzantine icons and mosaics with gold glass backgrounds, and the saint illustrated here. The wires and enamels are then added as before. The outline of the design will be apparent on the reverse of the base plate. The transition between the two techniques occurs around 900 in Byzantine enamel, and 1000 in the West, though with important earlier examples. The plaques with apostles of around the latter date on the Holy Crown of Hungary show a unique transitional phase, where the base plaque has hammered recesses for the design, as in senkschmelz work, but the enamel covers the whole plaque except for thick outlines around the figures and inscriptions, as in the vollschmelz technique (see the gallery below for examples of this technique and vollschmelz work). Some 10th-century pieces achieve a senkschmelz effect by using two plates superimposed on each other, the upper one with the design outline cut out and the lower one left plain. From Byzantium or the Islamic world the technique reached China in the 13-14th centuries; the first written reference is in a book of 1388, where it is called "Dashi ware". No Chinese pieces clearly from the 14th century are known, the earliest datable pieces being from the reign of the Xuande Emperor (1425–35), which however show a full use of Chinese styles suggesting considerable experience in the technique. It was initially regarded with suspicion by Chinese connoisseurs, firstly as being foreign, and secondly as appealing to feminine taste. However, by the beginning of the 18th century the Kangxi Emperor had a cloisonné workshop among the many Imperial factories. The most elaborate and highly valued Chinese pieces are from the early Ming Dynasty, especially the reigns of the Xuande Emperor and Jingtai Emperor (1450–57), although 19th century or modern pieces are far more common. The Chinese industry seems to have benefited from a number of skilled Byzantine refugees fleeing the Fall of Constantinople in 1453, although based on the name alone, it is far more likely China obtained knowledge of the technique from the middle east. In much Chinese cloisonné blue is usually the predominant colour, and the Chinese name for the technique, jingtailan ("Jingtai blue ware"), refers to this, and the Jingtai Emperor. Quality began to decline in the 19th century. Initially heavy bronze or brass bodies were used, and the wires soldered, but later much lighter copper vessels were used, and the wire glued on before firing. The enamels compositions and the pigments change with time. In Byzantine pieces, and even more in Chinese work, the wire by no means always encloses a separate color of enamel. Sometime a wire is used just for decorative effect, stopping in the middle of a field of enamel, and sometimes the boundary between two enamel colors is not marked by a wire. In the Byzantine plaque at right the first feature may be seen in the top wire on the saint's black sleeve, and the second in the white of his eyes and collar. Both are also seen in the Chinese bowl illustrated at top right. The Japanese also produced large quantities from the mid-19th century, of very high technical quality. In Japan cloisonné enamels are known as shippō-yaki (七宝焼). Early centres of cloisonné were Nagoya during the Owari Domain. Companies of renown were the Ando Cloisonné Company. Later centres of renown were Edo and Kyoto. In Kyoto Namikawa became one of the leading companies of Japanese cloisonné. The Namikawa Yasuyuki Cloisonné Museum is specifically dedicated to it. Russian cloisonné from the Tsarist era is also highly prized by collectors, especially from the House of Fabergé or Khlebnikov, and the French and other nations have produced small quantities. Chinese cloisonné is sometimes confused with Canton enamel, a similar type of enamel work that is painted on freehand and does not utilize partitions to hold the colors separate. In medieval Western Europe cloisonné enamel technique was gradually overtaken by the rise of champlevé enamel, where the spaces for the enamel to fill are created by making recesses (using various methods) into the base object, rather than building up compartments from it, as in cloisonné. Later techniques were evolved that allowed the enamel to be painted onto a flat background without running. Plique-à-jour is a related enameling technique which uses clear enamels and no metal backplate, producing an object that has the appearance of a miniature stained glass object - in effect cloisonné with no backing. Plique-a'-jour is usually created on a base of mica or thin copper which is subsequently peeled off (mica) or etched away with acid (copper). Other ways of using the technique have been developed, but are of minor importance. In 19th century Japan it was used on pottery vessels with ceramic glazes, and it has been used with lacquer and modern acrylic fillings for the cloisons. A version of cloisonné technique is often used for lapel badges, logo badges for many objects such as cars, including BMW models, and other applications, though in these the metal base is normally cast with the compartments in place, so the use of the term cloisonne', though common, is questionable. That technique is correctly referred by goldsmiths, metalsmiths and enamellists as champlevé. A large collection of 150 Chinese cloisonné pieces is at the G.W. Vincent Smith Art Museum in Springfield, Massachusetts. First the object to be decorated is made or obtained; this will normally be made by different craftspeople. The metal usually used for making the body is copper, since it is cheap, light and easily hammered and stretched, but gold, silver or other metals may be used. Cloisonné wire is made from fine silver or fine gold and is usually about .010 x .040 inches in cross section. It is bent into shapes that define the colored areas. The bends are all done at right angles, so that the wire does not curve up. This is done with small pliers, tweezers, and custom-made jigs. The cloisonné wire pattern may consist of several intricately constructed wire patterns that fit together into a larger design. Solder can be used to join the wires, but this causes the enamel to discolour and form bubbles later on. Most existing Byzantine enamels have soldered cloisons, however the use of solder to adhere the cloison wires has fallen out of favor due to its difficulty, with the exception of some "purist contemporary enamellists" who create fine watch faces and high quality very expensive jewelry. Instead of soldering the cloisons to the base metal, the base metal is fired with a thin layer of clear enamel. The cloisonné wire is glued to the enamel surface with gum tragacanth. When the gum has dried, the piece is fired again to fuse the cloisonné wire to the clear enamel. The gum burns off, leaving no residue. Vitreous enamels in the different colors are ground to fine powders in an agate or porcelain mortar and pestle, then washed to remove the impurities that would discolor the fired enamel. Each color of enamel is prepared this way before it is used and then mixed with a very dilute solution of gum tragacanth. The vitreous compound consists of silica nitre and lead oxide to which metallic oxide is added for coloring. Using fine spatulas, brushes or droppers, the enameler places the fine colored powder into each cloison. The piece is left to dry completely before firing, which is done by putting the article, with its enamel fillings, in a kiln. The enamel in the cloisons will sink down a lot after firing, due to melting and shrinkage of the granular nature of the glass powder, much as sugar melting in an oven. This process is repeated until all cloisons are filled to the top of the wire edge. 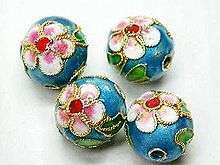 Three styles of cloisonné are most often seen: concave, convex, and flat. The finishing method determines this final appearance. With concave cloisonné the cloisons are not completely filled. Capillary action causes the enamel surface to curve up against the cloisonné wire when the enamel is molten, producing a concave appearance. Convex cloissoné is produced by overfilling each cloison, at the last firing. This gives each color area the appearance of slightly rounded mounds. Flat cloisonné is the most common. After all the cloisons are filled the enamel is ground down to a smooth surface with lapidary equipment, using the same techniques as are used for polishing cabochon stones. The top of the cloisonné wire is polished so it is flush with the enamel and has a bright lustre. Some cloisonné wire is electroplated with a thin film of gold, which will not tarnish as silver does. The Khakhuli triptych, a large gold altarpiece with over 100 Georgian and Byzantine plaques, dating from the 8th to 12th centuries, said to be the largest enamelled work of art in the world. The 12th century Mosan Stavelot Triptych, combining cloisonné and champlevé work. 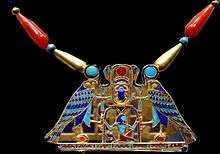 The Pectoral of Tutankhamun, (image), and several others. Shrine with an Image of a Bodhisattva, 1736-1795. Shrine: Cloisonné enamel on copper alloy; File: Copper with semiprecious stones. Pectoral of Senusret II, from his daughter's grave. Cloisonné inlays on gold of carnelian, feldspar, garnet, turquoise, lapis lazuli. Visigothic 6th-century eagle-fibula, from Spain with glass-paste inlay. Japan Kyoto Cloisonne Enamel Vase (1875th - 1880th). ↑ The date of the change is uncertain, partly because Early Byzantine enamels were much forged in 19th century Russia, rather confusing historians. ↑ Ross, 99, describing what appear to be trainee pieces in bronze, never completed. 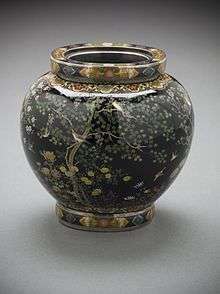 "Japanese Cloisonné: the Seven Treasures". Victoria and Albert Museum. Retrieved 2009-08-30. Wikimedia Commons has media related to Cloisonné.